“Photographs of the Inauguration proceeding were intentionally framed in a way to minimize the enormous support it had gathered on the National Mall,” Spicer said. He added, it was the first time in the nation’s history that white floor coverings had been used to protect the grass and that they amplified empty spaces, whereas the grass had minimized the appearance of spaces in the past. 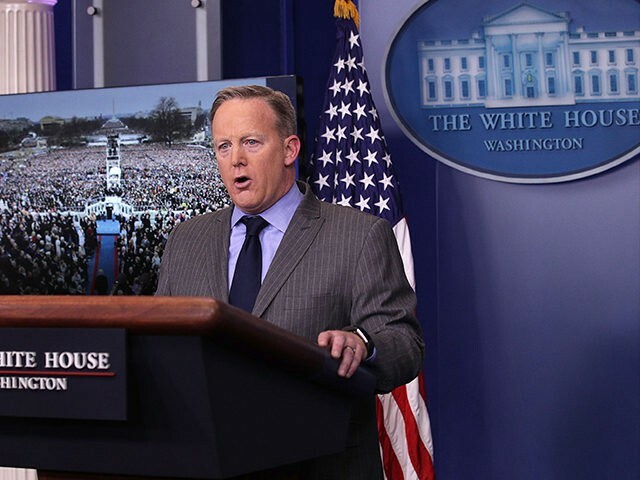 “Inaccurate numbers regarding crowd size were also tweeted,” Spicer said. “No one had numbers, because the National Park Service, which controls the National Mall does not put any out.” He said this also applies to any attempts to count the numbers of protesters during the “Women’s March” on Saturday. Spicer’s criticism of the media’s fake news reporting resulted in a media meltdown on social media. In that rendition of history Spicer gave, with no q's taken and false info given, the reality of what's happening w rallies doesn't exist. Spicer, before walking out without questions, says they will begin to hold the press "accountable." No idea what that means. I'm relieved @PressSec Spicer hauled in press to whine about crowd estimates. I worried he was going to announce we nuked Denmark. OMG: Spicer is accusing media of "intentionally framing" photographs to minimize inauguration turnout!